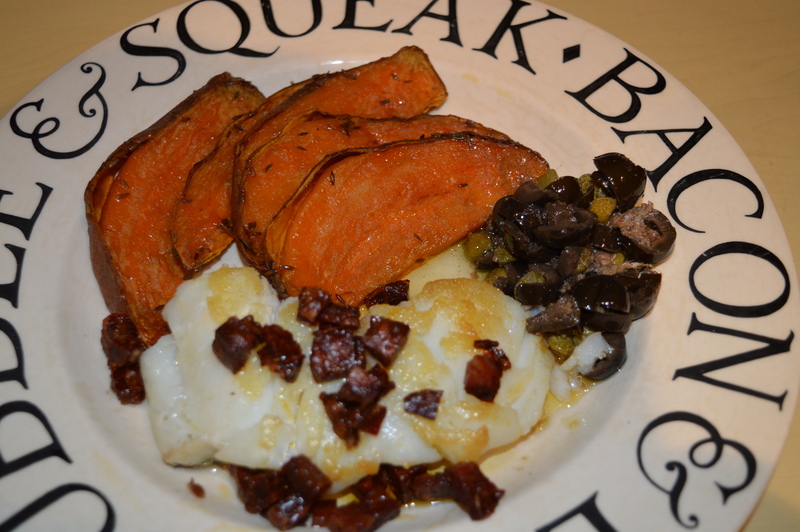 A healthy version, rather than ‘posh’, here we use cod, but any fish will do in this dish. Dawn: I love the bright orange! Is that sweet potato? Andrew: It is! Actually it is sweet potato wedges rather than chips per se. Dawn: And the posh bits? In an oven at 200ºC/Gas Mark 6, place a baking tray with the sliced sweet potato wedges, drizzled in a little olive oil, and sprinkled with a few cumin seeds. Season well. Cook for 25-30 minutes, turning part way through so evenly cooked. After about 15 minutes, heat a little oil in a pan, and cook the fish, skin side down. Turn after 5-7 minutes, then scatter the cubed chorizo into the pan. The chorizo will crisp up while the fish continues to cook. When cooked through thoroughly, plate up the dish. Arrange a few slices of sweet potato in a fan shape, place the fish below, scattering the chorizo on and around the fish. Place a generous spoonful of the puttanesca sauce alongside the fish. Dawn: The puttanesca makes a pungent alternative to mushy peas doesn’t it? Andrew: The chorizo allows for a bit of crispy bite, and if you wish adds some orange to the oil, which can also be drizzled over the fish. Keep following the blog https://forfoodlovers.wordpress.com and our Twitter account @Love_Food_UK as well as our Facebook and Mumsnet accounts. 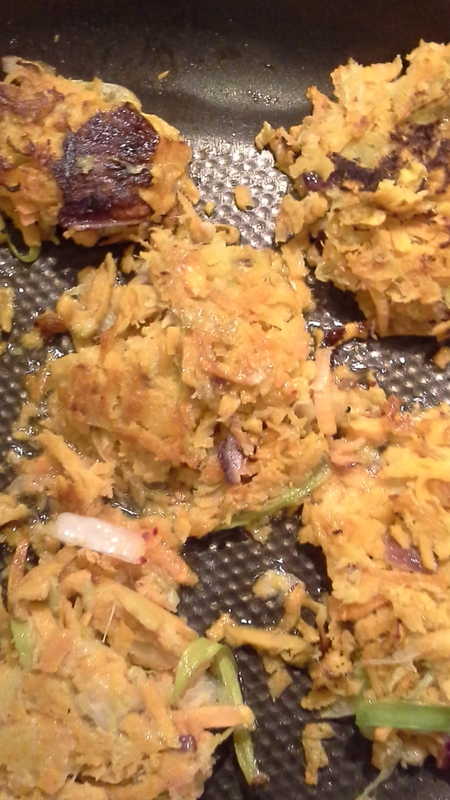 We love sweet potatoes in the Love Food kitchen, and this was an experiment, based on traditional potato cakes and rosti. Dawn: All excellent accompaniments. These have wonderful colour. Is that leek that I spy there? Andrew: You can see it there, and there is a little red onion too. Grate the sweet potato, or put through the food processor. Place all the vegetables in a bowl and leave for half an hour. A lot of liquid will come out of the sweet potato. Drain will, and squeeze out in some kitchen towel. Return to the bowl, mix in the egg if using and season with salt and pepper. Take a handful, shape into a ball between floured hands and press down so about 1.5-2 cm thick. Repeat with all of the mix. Heat a large pan, add a little olive oil and fry for 5-7 minutes on each side. Turn carefully so they don’t break up. Andrew: These are excellent with any meat dish or with a salad are a filling lunch. Dawn: And if you vary your seasonings, such as garlic or chilli, you can give a real kick to the cakes! For more fabulous tips and ideas follow our blog www.forfoodlovers.wordpress.com and our Twitter account @Love_Food_UK for daily tips and recipes ideas.